The first rule of improvisation is… SAY YES. When you’re improvising, you are required to agree with whatever your partner has created. So if we’re improvising and I say, “Freeze, I have a gun,” and you say, “That’s not a gun. It’s your finger,” our improvised scene has ground to a halt… Respect what your partner has created. Agree and see where that takes you. As an improviser, I always find it jarring when I meet someone in real life whose first answer is no. “No, we can’t do that.” “No, it’s not in the budget.” “No, I won’t hold your hand for a dollar.” What kind of way is that to live? All I can say, Tina, is…that will preach. Several years ago, our leaders learned an essential truth of congregational transformation: if it matters to mission and ministry; if it matters to your community and the future of your church; if your leaders have discerned the call of God and the moving of the Spirit in a particular direction; you don’t take a vote. Holy subversive operations, Batman! That was the most freeing thing we’d ever heard. We still vote on business matters, like the budget, or the calling of ministry staff. But when it comes down to fundamentals of mission and vision, we pray, we discuss, and then we do. It doesn’t mean that a handful of leaders plows through, regardless of how the community feels. Rather, it means we must find creative ways of getting input, communicating vision, and building a sense of shared mission. Foothills took its time in the Open & Affirming journey. We began informal discussions, preaching and teaching moments, and practicing hospitality years ago. But we found, as every forward-moving church finds eventually, that silent welcome is not enough. Those who have been hurt by the church, or those who have just grown to believe that the church is a mass-production center of hate and exclusion, need to hear an overt statement of welcome if they are ever going to trust us enough to darken the door. Besides, we were drowning in mega-church land with no real sense of identity or neighborhood presence. It was time to say out loud who we were, or die trying. So the question became, how to gain consensus and share the vision, without taking a vote? How to make this step a statement of faith, rather than a business item? For several months, we had discussions in our small group ministry settings, and also held several open, all-church gatherings. We watched “For the Bible Tells Me So” about 84 times. We talked about it. We shared stories. And then, when the time came, we placed an open Mission Statement on the communion table. During the invitation portion of worship for several weeks, folks came forward to sign it. It was a powerful act of community. It did not set up “winners and losers,” like a formal vote would do. It did not invite painful division or contentious debate. There was ample time in other settings for people to ask their questions and share their concerns. And of course, folks were free not to sign, essentially voicing their opposition with a silent ‘no.’ However, the result was a resounding “yes.” In just 3 Sundays of worship, we had signatures to equal a firm majority. Some who signed have been here for 20+ years. Some were first-time visitors. But you know what? They are not visitors any more. Their names are on our mission statement. Yes, we lost a few folks. And yes, we are the Body of Christ, and we are heartbroken to lose so much as a toenail. But in a few short months, we have gained far more people than we lost. Most of those who did not sign are still with us. The invitation to yes omitted the “winner/loser” dynamic that drives so many people away from church in times of change. With the covenant approach to transformation, there is a lot more room for grace at our table; we come to church assuming that we are not going to agree with everyone about everything…because really, what fun would that be? I’ll just say this out loud…Our neighborhood is literally saturated with churches preaching everything from silent condemnation of LGBT people, to passive aggressive “love the sinner hate the sin” stuff, to outright hate and bigotry. Thing is, the silent no-sayers have many, many other places to go. As for radical hospitality and being Jesus to everybody else—we are the only game in town. (At least, in this end of town). If we are called, and if we are lucky, then ministry, on our best days, is one part Holy Spirit and two parts improvisation. We say yes…and see where that takes us. You are supposed to agree and then add something of your own. If I start a scene by saying “I can’t believe it’s so hot in here,” and you just say, “yeah…” we’re kind of at a standstill. But if I say “I can’t believe it’s so hot in here,” and you say, “yes, this can’t be good for the wax figures…” now we’re getting somewhere. The power of covenant is not just in saying ‘yes.” It is in saying “yes, AND” that we are transformed. We are not just agreeing with what has been put in front of us. We are helping to move the story along. How many people coming into our churches—or, God forgive us, sitting outside them and wondering—have been greeted with a firm “NO” every day of their lives? Like Tina said…What kind of way is that to live? The fun is always on the other side of “yes!” So is real ministry, mission, and vision for God’s becoming Church. YES opens the door; AND pushes us through, the Spirit wind at our backs. On this journey to becoming an inclusive, radically welcome Body of Christ– once all the cost has been weighed–there is only yes. Yes at the door, and yes at the table of mercy. Yes, you are welcome. AND yes, you can sit by me. Yes, I will let you speak, AND yes, I will hear your story. Yes, brothers AND sisters. Yes, black AND brown AND white folks. YES you are the body of Christ AND you are beloved of God. To feed our neighbors who hunger in body and soul, giving purpose to those with plenty, and abundance to those in need. 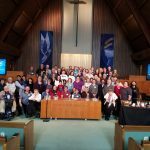 **Foothills Christian Church welcomes all people into community and ministry, regardless of age, race, gender, sexual identity, economic status, faith heritage or ability. We are Disciples of Christ, a movement for wholeness, and we are all a part of the ONE body of Christ.